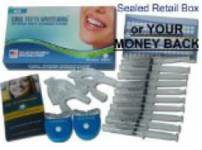 Dental Lab Whitening Gel Kits and Whitening Tray Kits at Home! Are you the ultimate Do-It-Yourselfer (DIY) when it comes to bleaching or whitening your smile? Those who buy name brand products online or from local stores: This includes Crest Whitestrips, Rembrant, SuperSmile, 5-Minute Whitening, and dozens more. But the savviest ones are those who discovered how to buy professional strength whitening gels, remineralization / desensitizing gels, and custom-made teeth trays and kits directly from dental labs! What's the Difference Between Store Brands and Dental Lab Kits? Often, store brands are made with a weaker concentration, or a weaker form of the whitening ingredient. When you buy direct, you can often buy a more potent product and combine it with a custom fit, dental lab-made whitening teeth tray to get you the best results possible. Store brands are good for new DIYers and those sensitive to the stronger ingredients. The problem with searching for dental labs on Bing or Google is you can waste a lot of time. It can take a long time to do the research because you often get back tons of results that have nothing to do with what you're looking for. And then, you won't have a convenient method to determine the sellers quality, level of customer service, or if they sell direct to the public (many do not). The good thing with this method, however, is that you may be able to contact the lab directly and ask your questions by phone. This is okay, but still not ideal. The problem with eBay is you'll also waste a lot of time and create frustration because you get a lot of suggestions that have nothing to do with what you want. And if you try to communicate with the seller, eBay acts as a filter. You'll probably not be able to call the lab directly by phone. And of this writing, eBay has customer satisfaction ratings for the seller in general, but not the specific product. This can be an issue, since most eBay sellers sell dozens or hundreds of products. You can't tell from the reviews if the 'kit' is any good. With their rating system you don't get a review on their individual products, which is important to you. Even so, at least you get an indication if the seller will ship on time and hold up their end of the deal. And eBay offers some additional protections you can't get on your own, if you're not satisfied. Unfortunately, it has the same product search and communication problems eBay does (mentioned above). But, their rating service is more transparent, in my opinion. Like the example on the left, and on the rest of this page. 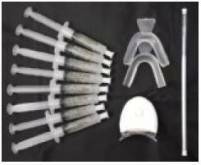 When you want to buy a teeth whitening kit that includes a custom-made teeth tray from seller 'A,' you can read specific reviews on the product; not just the seller. With Amazon's current customer review method, you get valuable feedback on both the dental lab and their whitening gel and tray kits. That's why I feel this makes the most sense for consumers. In the near future I plan to offer this service direct through SmileSteps.com and earning marks for service and quality.